What is a Diada Castellera? 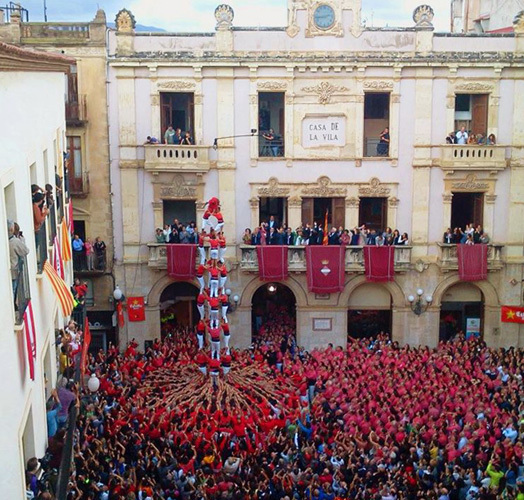 A diada castellera is the name of a gathering where colles build castells. Nothing more and nothing less. Diades are held mainly while in the major festivals of a city, town or village, or because a certain festivity, or because on behalf or to honour a colla. This is, according to the CCCC, there are nowadays almost 90 colles castelleres all around the Catalan Countries, and there are, usually, around 53 weeks in a year. This means that last year 2013 castells reached a record with about 10.400 castells raised, as I stated in the previous post. Unfortunately I can’t tell how many diades have been celebrated to achieve this record. Well, yes I could. There is data for it, it’s just that I am a lazybum and I have more stuff to do. But one day I’ll tell you more about the data applied in castells, it’s a whole world. I add it in the “posts to do” list. Nevertheless, a diada castellera has a protocol, the same way most of the proper fiestas have a procedure. Although, don’t get confused between the tunes and the protocol. While in this post I already wrote about the tunes of the castells, today I am going to center about the proper procedure of a diada castellera. And no, there is no Master of Ceremonies. At least usually. Although sometimes there could be a speaker, who actually is more annoying than useful. Most of them. There is a non-written rule in castells that at least three colles should perform in a diada, although there are exceptions, especially with the diades hosted by the biggest colles like Castellers de Vilafranca, Colla Joves Xiquets de Valls, Colla Vella dels Xiquets de Valls, Colla Jove Xiquets de Tarragona and Xiquets de Tarragona. Usually when it comes a diada hosted by any of these colles, instead of three colles performing, there are four colles. With the exception of the two colles from Valls when it comes to their village. Then it’s only they two alone. And the competence between these two colles is really, really fierce. Let’s imagine a Diada Castellera between the England Roses, the Scotland Thistles and the Wales Leeks in London. So, the plaça castellera could be, for instance, in London, in Trafalgar Square, just in front of Nelson’s Column. Just for the plasticity of the place. As the diada is held in London, the England Roses will raise their castells first. The Thistles and the Leeks will have to agree, or set a raffle, or spin a coin, to raise their castells after the Roses. As a diada has usually three rounds, plus the final round of pillars, sometimes it matters if you are the first, second or third in the round to build your own castells. Colles tend to help each other in the pinya, and if the castell fell down, the castell that your own colla wants to build may result jeopardised. Normally, for this, the biggest castells are build in the first round, because in case of fell the target is already reached. We can say that this diada had two big colles of 8, the Roses and the Thistles, and a colla who just entered the realm of the 8-story castells, the Leeks. The Roses did a great diada with a 4d8, 3d8 and a Td7, what is called a “clàssica de 8”. The Thistles tried hard but they had this unfortunate falling in the first round, which caused them a couple of casualties. Luckily they had the necessary replacements to achieve the 4d8 but they decided to lower the bar in the third round because they had not the necessary people. With this results, we could say that we would have been witnesses of the best diada overseas from Catalonia. 4d9sf (without folre, or “clean”) by the Colla Joves Xiquets de Valls in Plaça del Blat, Valls in the 2013 Diada de Santa Úrsula. You can notice a huge change of colour of shirts between one side and the other of the square. The ones who are building the castells (Colla Joves) have a red shirt. The ones who are watching it (Colla vella) have a “Rosé” shirt. The rivalry between these two colles is legendary. Around 200 years old. Older than Barça-Madrid rivalry! Les Santes: 27th July or the sunday before in Mataró. Sant Felix: 30th August in Vilafranca del Penedès. La Mercé: 24th September or next sunday, Barcelona. Santa Úrsula: 27th October or following sunday in Valls. This diada is always set by the Colla Joves Xiquets de Valls and Colla Vella dels Xiquets de Valls, and it is perfect if you want to see casteller rivalry to its maximum. Sant Narcís: 29th October or following sunday in Girona. Tots Sants: 1st November in Vilafranca del Penedès. Diada dels Minyons de Terrassa: penultimate sunday of November, Terrassa. Plus, every even year is set the Concurs de Castells in Tarragona. A three-day contest of castells. This year 2014 is set on the 4th-5th October. Just when I posted this article, news came to me that the Casteller de Barcelona colleague Xavi Vila just died. From Strength, Balance, Courage i Seny I want to send all my condolences to his family and the Castellers de Barcelona and now, more than ever I want to wish them a lot of strength, balance, courage and common sense to join them in these moments. The first sunday of Santa Tecla in Tarragona is also a great diada. 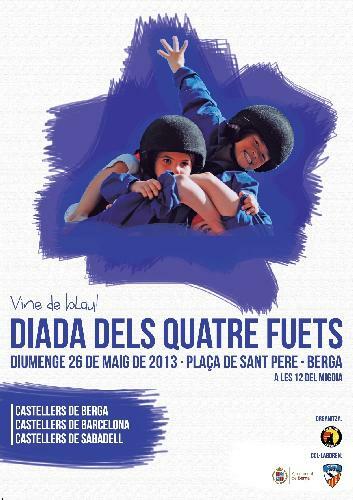 Actually it’s the second main diada of the year, with 7 gamma extra castells last year.